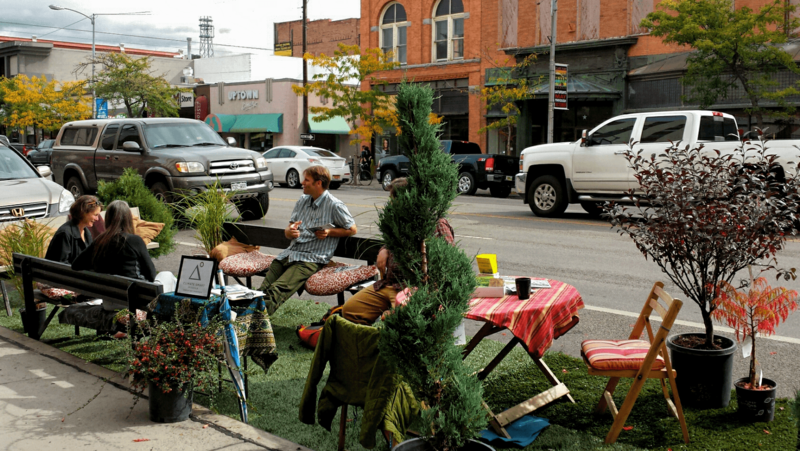 Park(ing) Day is an annual event which takes place on the third Friday of September. For one day paid parking places are turned into unusual spaces which bring to mind parks, gardens, or playgrounds. Their final shape may vary and will depend on the imagination of their makers. The event itself is more of a series of happenings, so how the spaces ultimately look, depends on available infrastructure and people who create them. The idea of the Park(ing) Day came into being in 2005 in San Francisco when a group of artists and designers called “Rebar” created a miniature park in one of the parking lots there. Since then, cities from all over the world join this action. Starting from 21 September, selected car parks will have quite other things “parked” there instead of cars, such as mobile cafes, food stands, or special events arranged just for the occasion. The aim of the whole performance is to assure city dwellers that it is the people who matter most in the public space. Because cities, most of all, have to be people-friendly. Another goal of the campaign is to balance mobility in the areas which normally are congested. Park(ing) Day is an element of the European Week of Sustainable Transportation, also known as the Mobility Week. The event, which boasts a tradition of 16 years, takes place between 16 – 23 September. It promotes sustainable transport solutions and ecological ways of traveling in the city, and it encourages drivers to swap their cars for public transportation or alternative means. The Mobility Week’s aim is also to prove that sustainable transportation can bring a lot of benefits, such as saving money and time, better health, higher levels of safety on the roads, a positive impact on the environment, and improved air quality. winkPark is committed to the very same goals, which is the reason why this year we have decided to join the Park(ing) Day. On 21 September, when winkPark users touch “Mark space’s details” option, a special icon in a shape of a tree will appear. This will enable other drivers to see which parking spaces are incorporated into the Park(ing) Day activities. winkPark, our innovative mobile application, relies on cooperation between drivers. With this, we want to reduce traffic congestion in urban spaces. Everyone who is part of the winkPark community facilitates others park and thus helps reduce the stress of searching for a free space. And the Park(ing) Day makes such a great opportunity to get to know winkPark!